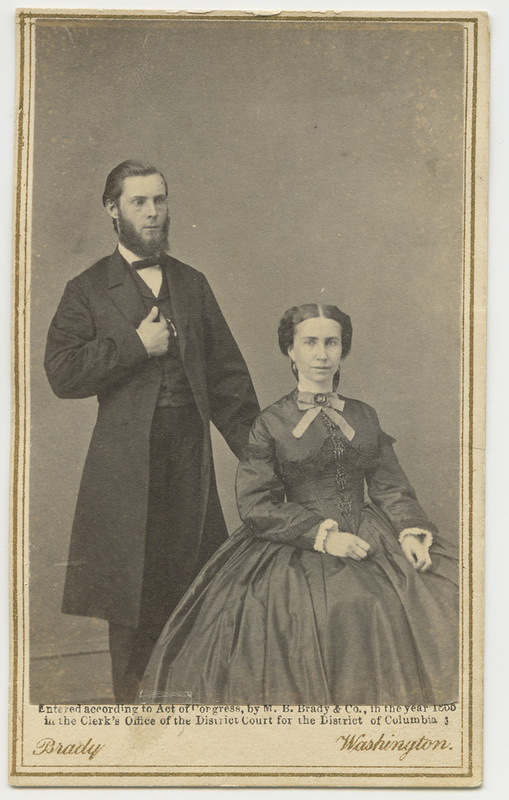 here is a young couple who posed at Mathew Brady’s Washington DC studio. They must have been “somebodys” because Brady bothered to copyright the image. I’ve seen enough of his images to notice that the copyright notice is used inconsistently, which leads me to think it was either to protect specific images because of the subject matter, or it may have been time-delimited as a result of a copyright dispute between himself and Alexander Gardner arising out of Gardner’s work for Brady during the Civil War. I’ve noticed it most often on the Fairy Wedding images, but also on the Brady version of the Seth Kinman elkhorn chair (I don’t have the Brady version, just the Alex Gardner version, which has Gardner’s studio stamp on the back, but Seth Kinman’s copyright notice on the front. I don’t recall if the Brady one has Brady’s copyright or Kinman’s). If any of you Civil War buffs or Victorian America historians recognize this couple, any information would be greatly appreciated. Previous PostAnother Tom Thumb, Lavinia Warren, George Nutt and Minnie Warren photo – for Queen VictoriaNext PostUpdate! Identity of Young Couple found!